Stonehouse Road in Boldmere was named after Stonehouse Farm. Stonehouse farm was established shortly after 1528, when Sutton Coldfield was incorporated by Royal Charter. The corporation, entitled the Warden and Society, took responsibility for Sutton Park, and also for a clause in the Charter designed to encourage new enterprise. This said that anyone wishing to establish a farm of up to sixty acres on the common lands could do so, paying a small ground rent to the Warden and Society. Bishop Vesey took an active interest in the town, probably encouraging his nephew, Thomas Gibbons, when Gibbons laid claim to sixty acres of Sutton Park, and the original farmhouse was one of the fifty-one stone houses built in Sutton by Bishop Vesey. The farmhouse stood just inside the park boundary, fronting onto the extensive Coldfield common (approximately where Corbridge Road meets Stonehouse Road now). There were no roads nearby, access being via a rough track across the common, and no pool or dam. 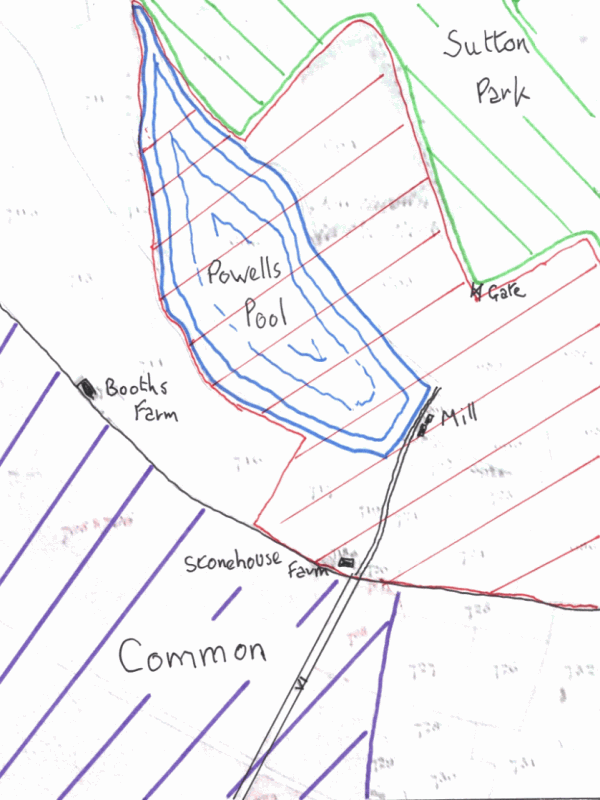 The northern boundary of the farm is now marked by an overgrown hedge at the top of the field above Powells Pool. The farm was transformed in 1730 (it was then part of the Aston Hall Estate of Sir Thomas Holt): thirty-five acres of the farm were flooded when a dam was built, the water from the resulting pool being used to power a water mill. The farm carried on in spite of this, though the farmland was reduced to forty acres. In 1824 William Powell was the tenant of Stonehouse Farm, the mill and the pool, renting from the Holt heir, Wriothesley Digby. William Powell lived at the farmhouse, but his main business was the manufacture of spades and forks at the mill. The extensive commons next to the farm were being enclosed in 1825, and this process involved setting out new roads across the commons to replace the rough tracks. One of these, road no. VI, is the present Boldmere Road and Stonehouse Road; it was “one road of the width of thirty feet commencing” at Chester Road “and extending in a northward direction over the Coldfield Common…terminating near the dwelling house late in the occupation of William Powell deceased at the gate at the south end of the road leading from the Coldfield Common to Sutton Park”. Access to the Park was along a private road through the farm to a private gate. There was more change in 1827, when the fields to the north of Powells Pool were added to the Park as part of the Hartopp Exchange, and Boldmere Gate moved to its present position. Living at “Stone House Forge in Sutton Coldfield” in 1856 was Mr. Francis Parkes, employer of thirty men; he had counted over 100 houses “on the Coldfield”, and the busy traffic of trippers to the Park along Stonehouse Road had begun. The derelict mill was demolished in 1937, the site was landscaped, and Stonehouse Road was widened and realigned as it is today. 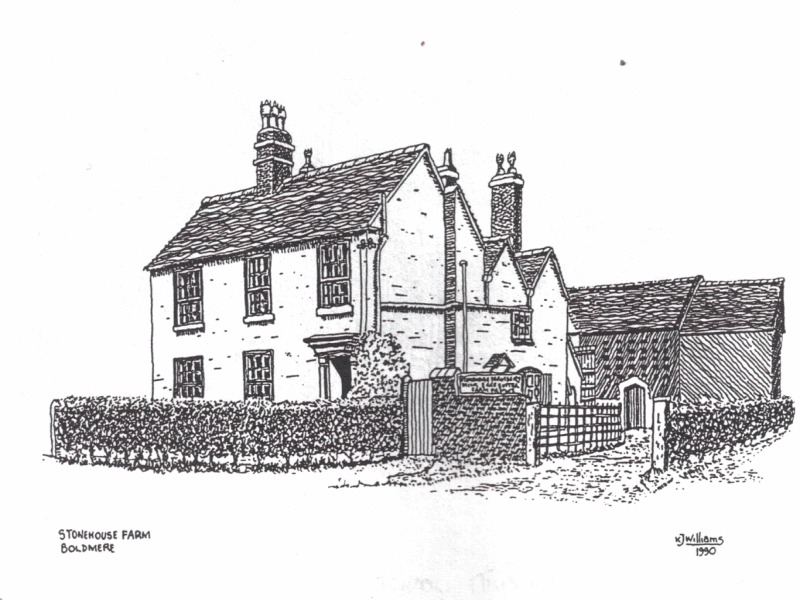 Stonehouse Farm, demolished in the 1950s, drawing by the late Ken Williams.